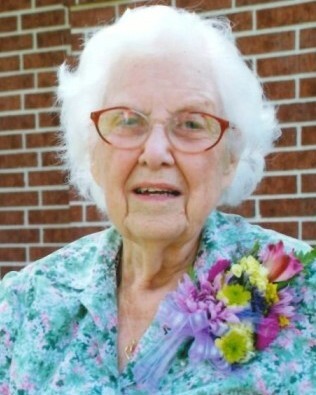 Evelyn Hazel Smith, 97, went to be with the Lord on Friday, November 30, 2018. She was born on April 1, 1921 in Portland, Maine to George Densmore and Hazel Speight Densmore. Evelyn had many hobbies like quilting, sewing, baking cookies, and playing Spinners. She enjoyed being out on the water with her family while boating, jet skiing, and swimming. Evelyn was known to kid around but would also let you know what you needed to do. She will be dearly missed by all who knew and loved her. She is preceded in death by her beloved husband, Henry Decosta Smith; and parents, George and Hazel Densmore. Evelyn is survived by her children, Preston M. Smith, Gary L. Smith, Donna G. Eagan, and Sandy C. Coleman; sister, Bunny Green; 9 grandchildren; 18 great-grandchildren; 4 great-great-grandchildren; and a host of extended family and friends. A visitation for family and friends will be held on Monday, December 3, 2018 from 4:00 p.m. to 7:00 p.m at Sterling White Funeral Home. Funeral services will begin at 2:00 p.m. on Tuesday, December 4, 2018 also at Sterling White Funeral Home. Interment will follow in Sterling White Cemetery. Arrangements have been entrusted to Sterling-White Funeral Home, 11011 Crosby-Lynchburg Rd, Highlands, Texas. To share memories and offer condolences please visit www.sterlingwhite.com.